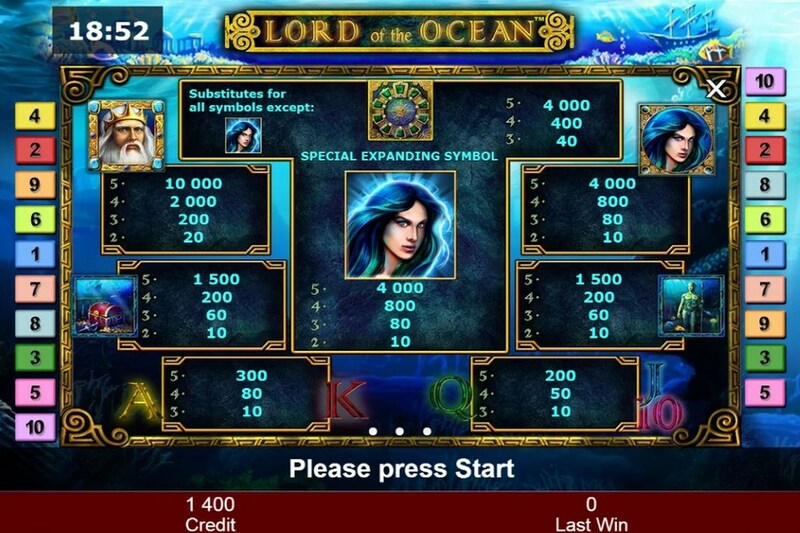 The design of the online slot game Lord of the Ocean is just fantastic. The ocean depth at the background made in marine colors already promises the interesting journey and acquaintances. The game symbols depict Poseidon, Naiad, old drowned temples and their treasures. They are nicely drawn and perfectly animated. 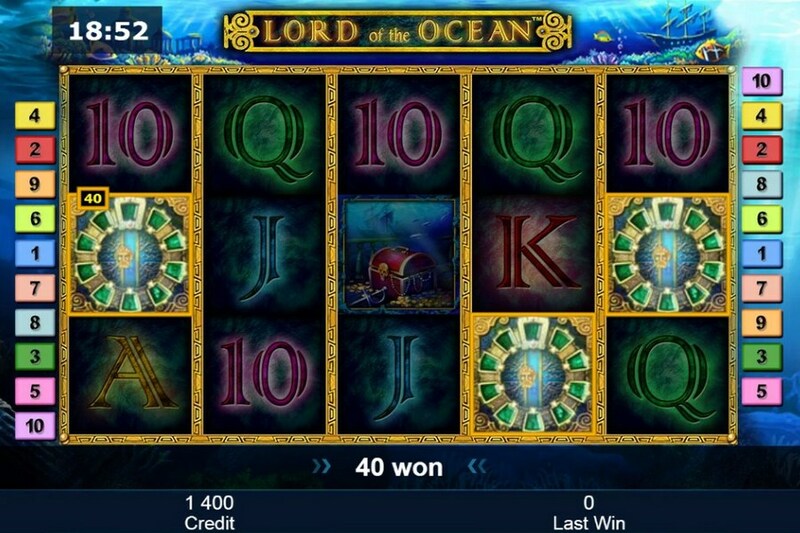 You will not get bored playing Lord of the Ocean online. Before you dare to take a trip into the deep ocean, please, place the bet and set the number of the pay line. Now take a deep breath and dive, or just spin the reels. Match the winning symbols combinations to achieve the main goal of the game and get the winnings. You will also like the additional features of the game which game developers put in the game. Well known free spins game is waiting for you. Once three or more Scatter symbols occur on the reels the feature is triggered and you get ten free spins and Special expanding symbol feature. At the beginning of the free games the one of the game slots symbols is selected as Special symbol. During the free spins it may expand to cover the whole reel and this can bring you additional winnings. The Scatter symbol acts also like the Wild symbol in the game and substitutes for all game symbols. The only exception is Special expanding symbol. And you can also multiply your winnings playing additional mini game. Once you won in the spin round you can press the Gamble button and try to guess the card color. The right guess multiplies your prize and gives possibility either to collect it or gamble again. The wrong guess voids all the pays for the round. 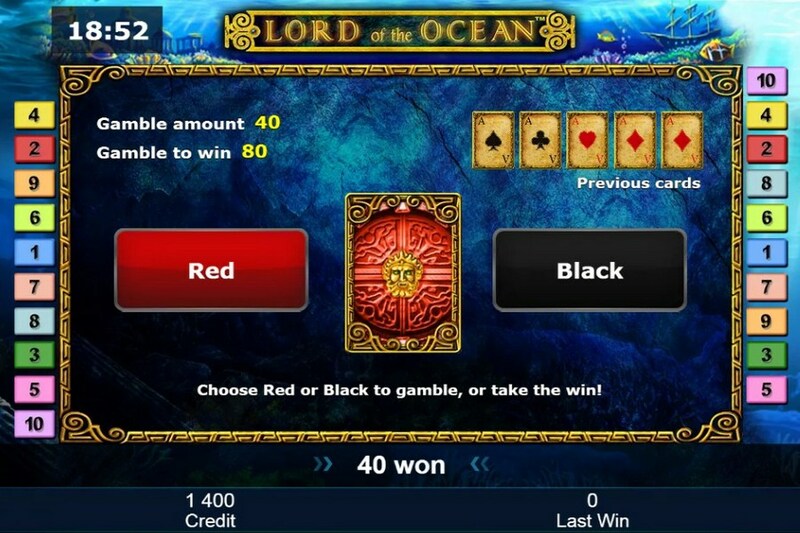 Play at Lord of the Ocean slot, touch the ancient mythology, look for the treasures in the deep of ocean and see what reward you will get.